I’m often asked about Tunis wool. Is it soft? What projects are it good for? Why do lambs have different colored wool than adults? Tunis wool is a fine to medium, down-type wool with lots of loft. If you’re not familiar with wool or fiber terms this means Tunis wool is soft and bouncy and makes light and springy yarn which is great for a variety of projects. Explaining the lambs’ coloring isn’t as simple. Tunis lambs are born with a short layer of cream-colored wool over their torsos and necks and light to dark cinnamon colored hair on their legs, heads and tails. 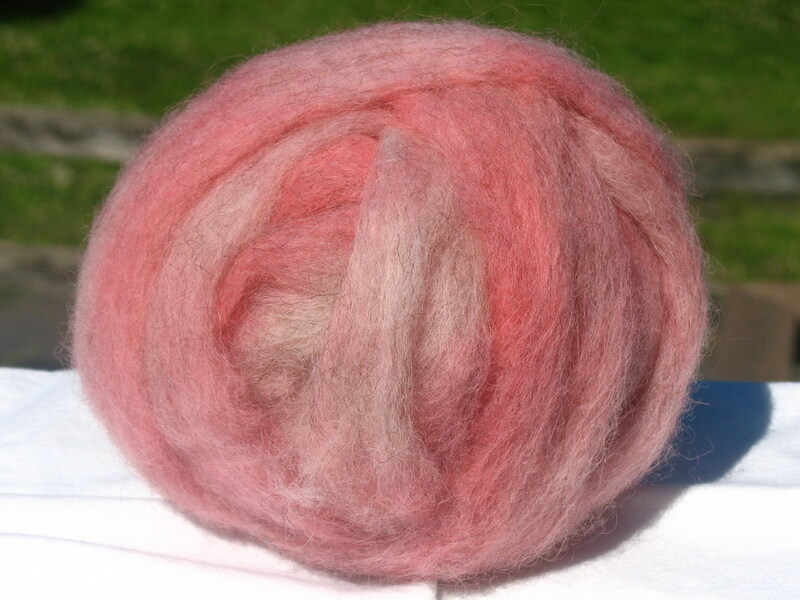 Intermixed in the wool are longer kemp fibers (think guard hairs) that can sometimes completely hide the wool. The amount of kemp fibers can vary between lambs, just as the cinnamon shade can. Below are twin lambs. Notice how one is much darker and also has more kemp fibers covering his wool. Over their first few months lambs appear to change from cinnamon to the lighter cream color of their parents. Their color doesn’t actually fade during this time. Their wool grows longer, though the kemp, but they also begin to shed much of those longer, darker kemp fibers. You can see this in the photo below of a 6 week old lamb. The kemp fibers are longer and becoming more sparse overall. By the time Tunis lambs are 3-4 months old they have the typical coloring associated with the adults. As Tunis sheep age their wool does lighten slightly. Their first fleece is usually a beautiful cream color and each year it will become whiter, although Tunis wool doesn’t ever become pure white. You can see the differences in color in the photo below. The two shorn ewes are 5 years old in this photo, the smaller lambs are all up to 8 weeks old and the larger lamb on the far right is 4 months old. And that is the not so simple explanation of why Tunis lambs seem to change color. Hope you enjoyed it! I’m sure you’ve all heard of the Tour de France, the 22-day long bicycle race across France starting on July 2nd … but how many of you have heard of the Tour de Fleece? I’m sure if you’re familiar with Ravelry you’ve heard of it! Many handspinners around the world spin yarn while the cyclist are racing. That’s right … 20 days of spinning at least a little each day with 2 rest days. For some, it’s simple. Others have it a little more challenging, especially those who have 2 young children, animals to feed and a growing garden. I did manage to spin every day that the cyclists rode. To kick off the Tour I even made a special dinner on July 2nd… One of our homegrown turkeys, rubbed with a mixture of olive oil and herbs de provence (brought home from Paris by my aunt!) 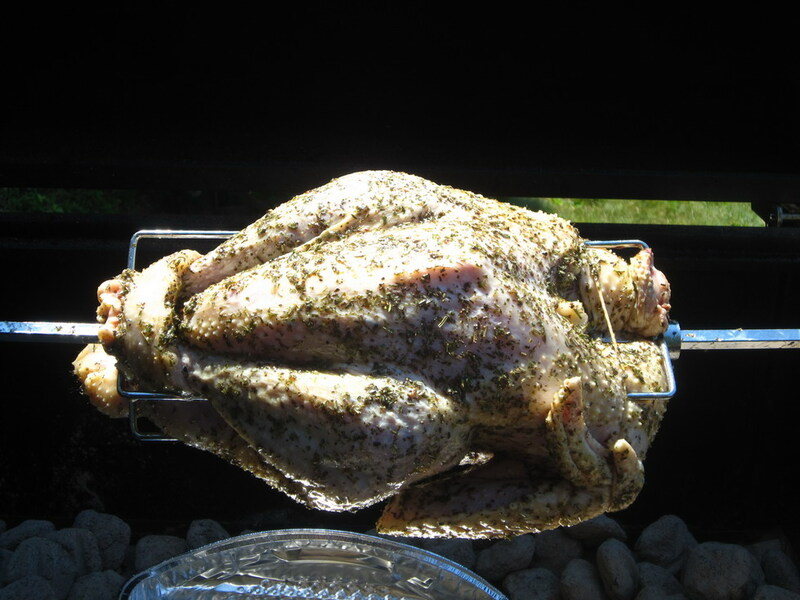 rotisseried on the grill. I also watched a lot of the race and really became interested in it. Noah loved watching it with me in the mornings, and Dave and I watched some of it at night, too. We all gasped when Johnny Hoogerland crashed and cheered for him when he continued racing. Today is supposed to be the last warm day in a while. The forecast says mostly sunny and 73 degrees – a perfect day to solar dye some wool. I mixed up my dye bath and set it out on the deck as usual. Because the air temperature is not too warm, I put a dark-colored blanket around the glass bowl to insulate it and warm it; and I placed aluminum foil around the back of the bowl. Later I used some old windows I bought a couple years ago to make a little solar dying “greenhouse”. It protected the bowl from the wind and helped it heat up better. The Garden State Sheep and Wool Festival was held on September 11th & 12th this year. I drove over on Saturday for the morning to enter 2 fleeces and 2 skeins for the competitions. I had a great time – the weather was beautiful and I got to meet up with some friends and talk with them. I entered my yarn in the Novice division of the skein competition since I’ve been spinning less than 1 year. My woolen Shetland yarn got 2nd place, while my worsted Merino yarn placed 4th! I’m very happy and excited about that. I'm holding my grey Shetland yarn on the left and my white Merino yarn on the right. I also entered 2 fleeces in the wool show. They didn’t place, but they both got a score of 81 (out of 100). And they both scored a 10 for my skirting… that was encouraging! Earlier this month I participated in the Robbinsville Elementary School’s Colonial Day and talked to the 3rd graders about spinning wool. I only had 2 weeks to prepare and it turned out a lot different than I imagined, but I still enjoyed it and I think the students did, too. 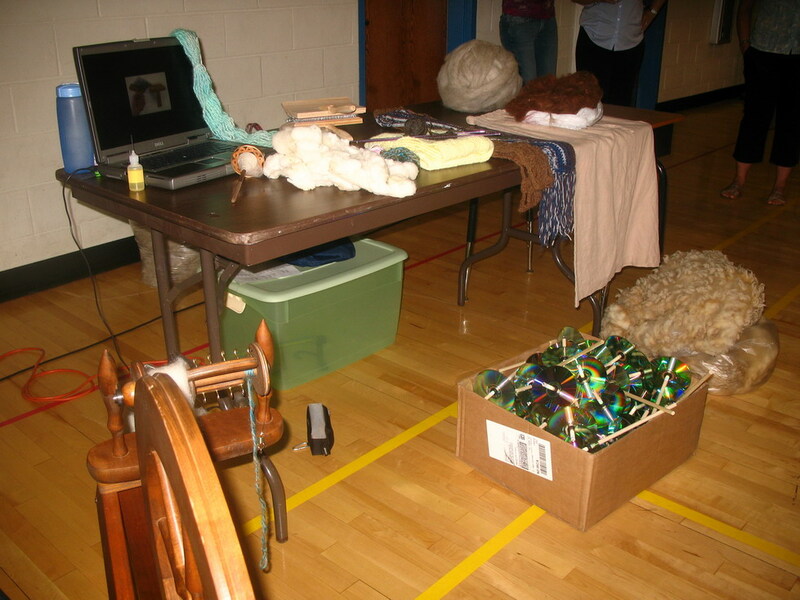 The wool spinning station was in the gym, which didn’t have good air conditioning….or didn’t have any. It was hard to tell. 🙂 There were about 45 students in each of 6 sessions, which were 30 minutes. 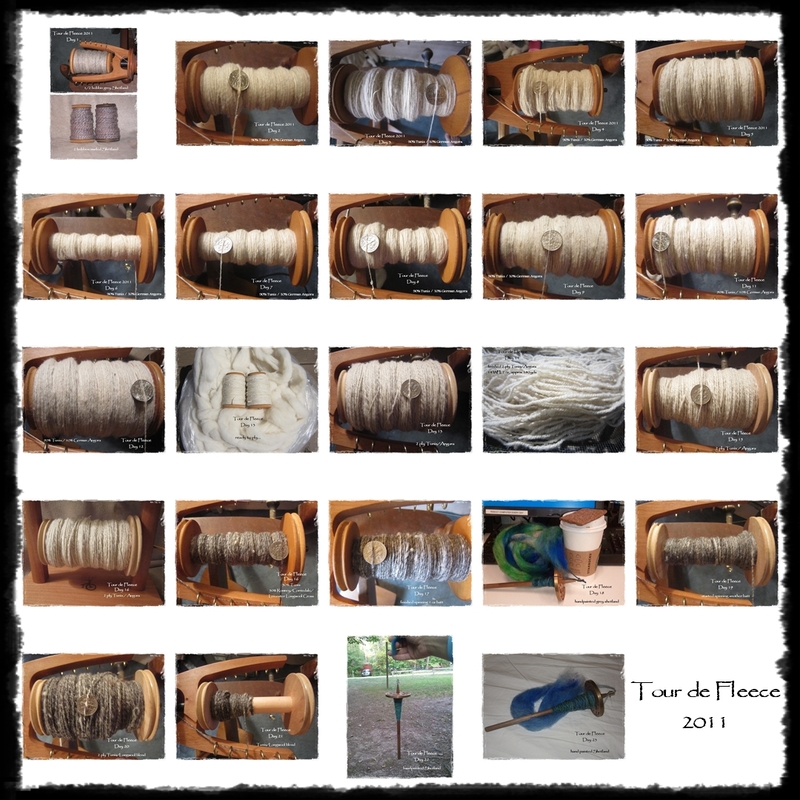 I talked about the history of spinning and the tools used in spinning. Everyone then got some wool and a spindle to try spinning. After the first 2 groups, I took the cd’s off my homemade spindles and the rest of the students just used the hooked dowels. They were much easier to use! 2 students were allergic to wool, and I felt bad that I didn’t bring any other fibers “just in case”. I will definitely bring some next year. I also have a list of other things I want to improve on for next year….at least I have a better idea of what I’m doing now! Thursday was a beautiful sunny day in the 70s…perfect for picking strawberries and sunny enough to do some solar dyeing. I got my wool ready for the dye “bowl” before we left for the morning. 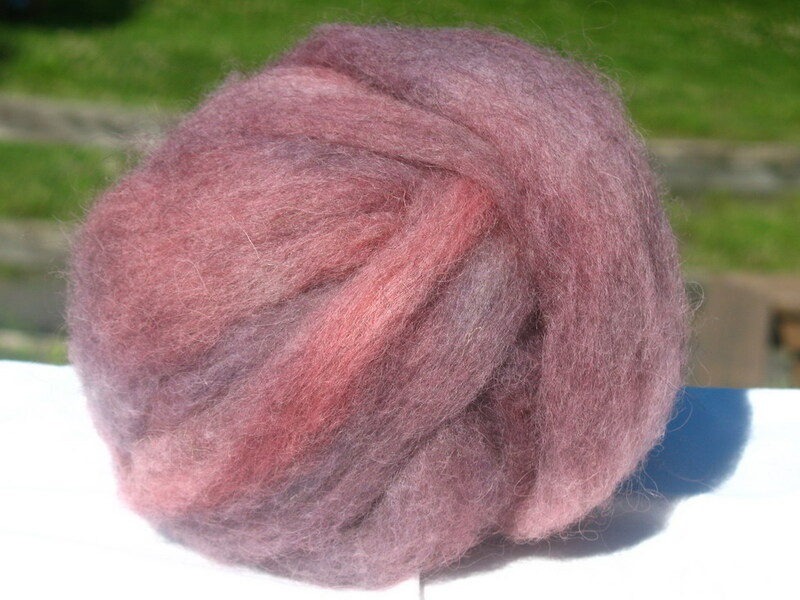 I dyed 2 batches of the grey shetland that I bought in Ohio with Kool Aid…each was 2 ounces. For batch #1 I used 4 packs of Pink Lemonade and about 1/8 teaspoon of Grape. Batch #2 got 2 packs of Grape. I love how the wool turned out! Because the sun warms the water slowly, the dyes aren’t absorbed into the wool uniformly and result in a naturally varigated yarn or, in this case, roving. The other reason I love solar dyeing is – it’s so easy! Especially when you have a million other things to do and/or children who need your attention. #1 – soak fiber in warm water with a drop of detergent or Jet Dry. 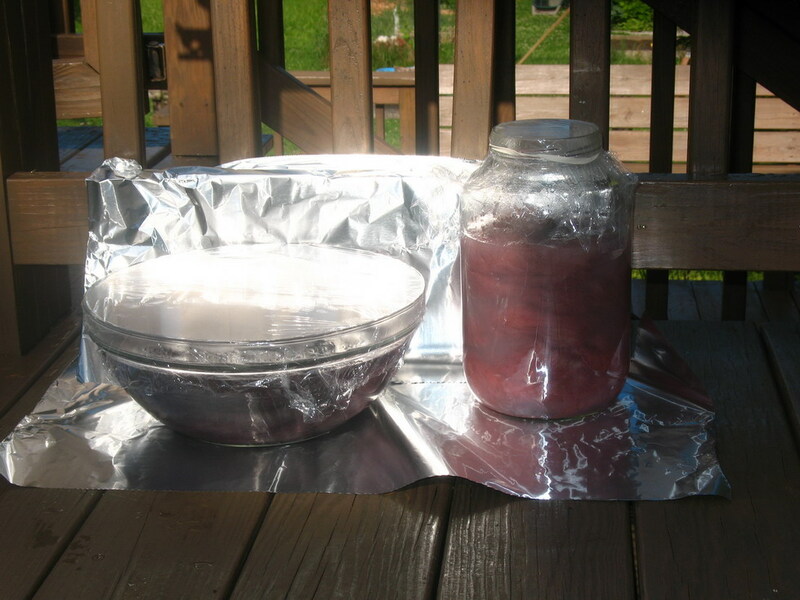 #2 – fill glass container with water, 1 cup vinegar and dye. #3 – squeeze excess water out of fiber and add to dye bath. #4 – put plastic wrap over top of bowl or container. #5 – place in sunny spot (I put some aluminum foil around it to reflect more sunlight onto the container). #6 – let it sit in the sun until water is clear (a few hours or all day). #7 – gently squeeze out water, rinse, set out to dry. After I put the wool on the deck we got ready to go strawberry picking. Hannah and Noah loved it….Noah may have enjoyed seeing all the big trucks and motorcycles drive by on the road more. Hannah ate a bunch of berries there. After almost every strawberry she picked, she looked at me and said “Mouth?” After trying to tell her she can’t eat the all and that we have to put them in the basket, I gave up. She had a berry juice stained face by the time we left. I wish I brought my camera with me. When we got home I made 2 batches of jam….yum! !